This year, Oregon-based bootmaker Wesco is celebrating its 100th anniversary with a collection of boots that pay homage to the brand’s storied history. One of the most notable boots from the centennial collection is the 1939 engineer boot. The style’s name references the first year that Wesco manufactured its Boss engineer boot, a distinctly American style that developed before World War II. The original engineer boots were designed to protect the feet of men who fed coals into steam engines. It melded the tall pull-on style of horse riding boots with the supportive arch and sole of a work boot. A buckled ankle strap makes the style instantly recognizable. Like its forebears, Wesco’s 1939 boot features a full naildown construction. In this method, which the brand used in the early 1900s, the vamp and counter are wrapped under the insole and nailed down. The midsole is then nailed to this stack of leather and the outsole is attached with a single row of stitching on a Rapid E machine. The approach produces a rebuildable boot — and a silhouette that’s sleeker than other, faster methods. After the WWII, engineer boots became a favorite of motorcycle riders across America. 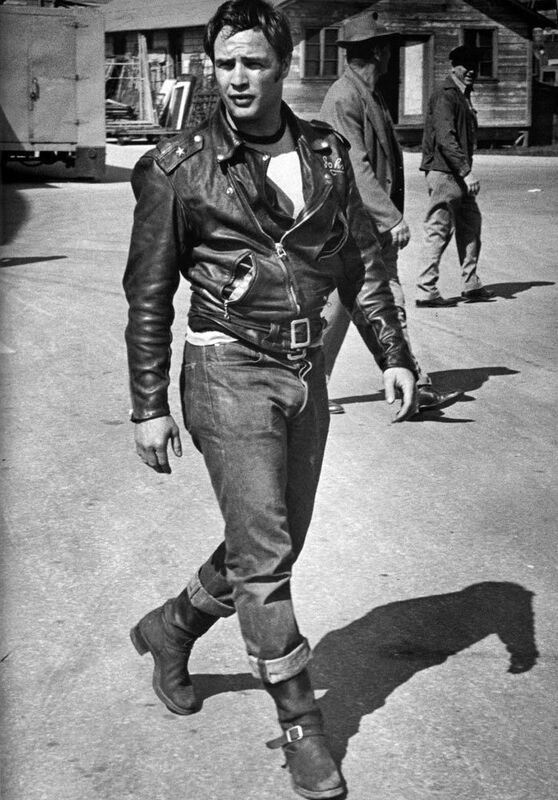 Marlon Brando wore a pair in 1954’s The Wild One. A year later, James Dean’s character wore a pair in Rebel Without a Cause, and the style saw an increase in popularity in the ’50s and ’60s. While the boot isn’t as prominent today as it once was, there is a small group of brands making a strong case that it should be. Focusing on high-quality materials and construction, these brands honor the rugged, functional roots of the engineer boot with vintage-inspired styles designed to be worn hard. The 2966 engineer boot is closely based on a similar style developed by Red Wing in the 1930s. The style features Black Klondike leather from S.B. Foot Tanning Company which is double-tanned to be black with a brown core (similar to leather used in Red Wing’s historic boots). In 1939, Oregon-based Wesco introduced its iconic Boss engineer boot which featured full naildown construction. To celebrate the brand’s 100 year anniversary, Standard and Strange is offering limited edition release that features vintage construction techniques and British Tan leather uppers. This engineer boot is a variation of Viberg’s best-selling motorcycle boot. It has a shorter 8-inch shaft, deeper side gussets, a Cats Paw sole and Japanese buckles. The boot is made with brown Chromexcel leather and stitchdown construction. This small-batch Japanese boot is made with a custom-made batch of natural pull-up Chromexcel leather made to reflect even occasional wear and develop a unique broken-in appearance. The style features British Goodyear storm welting, Vibram soles, Japanese steel shanks, a hand-stitched shaft seam and custom brass and iron buckles. Originally released in 2009, this vintage-inspired engineer boot is made from vegetable-tanned leather that is hand-dyed and designed to develop a historically-accurate patina. Made in the USA, this boot features a low-toe profile, vintage-style steel roller buckles and a curve-pattern instep strap (un-cinch to pull boots on). Standard and Strange calls these the “absolute best in engineer boots,” and for good reason. They feature Horween Chromexcel leather, Japanese steel shanks, British Goodyear storm welting and brass-coated steel buckles from Tokyo. Made in Japan, the are designed around a ‘50s-style last that has a tapered shape with no toe bump. Japan-based brand The Real McCoys has a reputation for producing some of the best vintage reproductions money can buy, and these boots are no exception. They are cut from durable Japanese vegetable-tanned horse buttock and are a perfect replica of original ‘50s Buco engineer boots (Buco was an American brand founded in 1933 that specialized in motorcycle apparel and accessories). They feature copper-riveted steel shanks, Cat’s Paw soles and iron buckles. Made in LA by Brian the Bootmaker, these engineer boots are handmade specifically to your measurements. They are hand-welted and feature a triple-stitched lined vamp, a hand-shaped leather counter, a double-stitched Role Club halfsole secured with brass rivets and a hand-crimped toe track (upon request).